What moves would have to be played leading up to this, obviously both players would have to chip in, but how would this work? Is it even possible to get this board playing with actual rules? Note that the white king passes the squares f6 and d4 multiple times, which is allowed (what is not allowed, is jumping the same piece more than once). Because a jumped piece is at least 2 rows and columns away from another jumped piece, it is impossible to add more pieces to this configuration. And because of the board symmetry, it is easy to see that shifting the pieces will also not work. Not the answer you're looking for? Browse other questions tagged checkers or ask your own question. Is it possible to get a stalemate in Checkers? How many kings is it possible to have on the board at once? 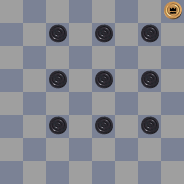 Can a double jump move backwards in Checkers/Draughts? 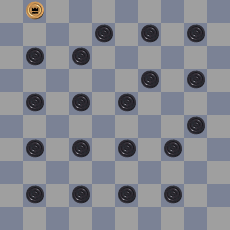 How many turns does an average game of Checkers/Draughts go for?